First of all the Algiz XRW delivers the productivity you need. It has a full keyboard and a 10.1 inch touchscreen with MaxView™ screen technology. It comes with a fast and powerful 2 GHz Intel Atom processor. It includes a 64 GB solid state disk and 2 GB of DDR 2 RAM and runs Microsoft Windows 7 Ultimate, just like the PCs in the office, but you can do your work in the field under almost any conditions. This powerful performer offers ultra rugged toughness. The “XRW” stands for “eXtreme Road Warrior” and this device lives up to its name. Its keyboard and mouse touchpad, illuminated by two led lights, are fully sealed, and it carries an overall IP65 rating against sand, dust and water. It meets stringent MIL STD 810 G military standards for withstanding humidity, vibration, drops and extreme temperatures. 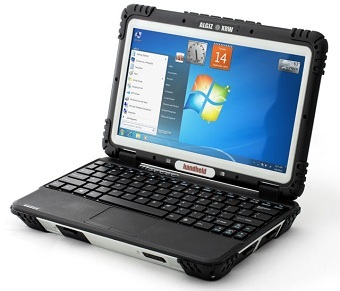 This rugged computing tool, with its "take it anywhere" functionality comes in an impressively portable package. The compact, slim Algiz XRW weighs in at only 1.5 kg. Once you’re in the field, the Algiz XRW presents an array of mobile capabilities. It has integrated GPS functionality, Bluetooth for short range wireless connection to other equipment, and 802.11 b/g/n WLAN if you have a local network you’d like to sync with. An optional 3 G modem can provide high speed GSM/UMTS/EVDO data transmission. The Algiz XRW comes with optional Gobi™ 2000 technology – which means you’ll be able to work on your choice of wireless frequency anywhere in the world. And you can put in a full day’s work with a 57.72 Wh battery that works for 8 hours on a charge. The Algiz XRW features a built in 2 megapixel autofocus camera that allows video conferencing in the field. And viewing information on the 10.1 inch screen is easy under any conditions with the unique MaxView™ technology that provides spectacular visibility even in direct sunlight conditions. You can quickly back up field data using an SD card in the provided slot, and you can choose from multiple connectivity options using two USB 2.0 ports and one RS232. And the Algiz XRW offers an optional Kensington lock for "in the field" security.